Somehow I do believe we will find that alcohol was involved. 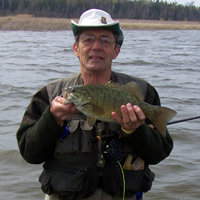 I just recieved this: Dan Grigas To:Everyone Staff DL Cc:Commissioners' DL Apr 2 at 8:10 AM Hello all, I wanted to reach out to everyone following the 2019 Trout Fishing for Kids (TFFK) program at Wood Dale Grove and let you all know that this year’s event was extremely successful. The weather was less than ideal for being outside as a human, but was what many would consider great conditions if you are a fish. In my 6 years at the district, this was largest turnout that I have witnessed (So busy that we ran out of bait at 9:30 am.). The parking lot at Wood Dale has a capacity of 116 spots including handicap parking, but that was not enough for the day, as we had to park another 20 vehicles along the curbs. Many kids walked away with their limit of fish. There were some great moments of people helping people, including experienced groups hanging around after they caught their fish to assist newcomers in order to ensure a successful outing. Furthermore, our volunteers and staff were amazing and are invaluable resources for knowledge and willingness to assist patrons. Commissioner Painter also braved the weather with us and handed out bait all day, and LL Bean made a great splash for their first TFFK raffling off two new fishing poles. Overall, I could not be happier with the outcome of the event this year, and it is largely due to the wonderful people that work and volunteer here. Without coordination and assistance from numerous departments, this event and others like it would not be nearly as successful nor as enjoyable. Thank you all very much. Norm Perkins, John Loebach, Craig and I turned out to give a hand to Dan Grigas and the Forest Preserve District of Du Page County with their Trout Fishing for Kids event. We met for breakfast and then headed over to Wood Dale Grove where we met Dan and did what we could to be of help. Thanks Craig, I just knew that you would be there. Dan Grigas has again asked the I S A if we would care to have some volunteers to help out at the Forest Preserve District of DuPage County trout fishing for kids event ; (March 6, 2019) — Kids ages 15 and under are invited to feel the thrill of catching a fish at “Trout Fishing for Kids” on Saturday, March 30 from 8 a.m. to noon at the Forest Preserve District of DuPage County’s Wood Dale Grove Forest Preserve in Wood Dale. "Kids get a great opportunity to fish 9-acre Grove Lake after it’s been stocked with rainbow trout but before the official spring opener, giving them a better chance to catch fish. Family members 16 and older are welcome to join the young anglers but may not fish themselves. The event is free and registration is not required. Some equipment will be available for loan, but participants are encouraged to bring their own gear. Bait is provided. The entrance to Wood Dale Grove Forest Preserve is on Wood Dale Road 0.5 mile north of Lake Street. For more information, call 630-933-7248." While this event is not about smallmouth it is about introducing kids to the outdoors and fishing. Should you be interested in helping out even for just a portion of the time we will meet at the Sunmist Restaurant, 501 East Lake st Addison il. at 7:00am Saturday,March 30th for breakfast and then head over to Wood Dale Grove lake. Not much that most of us don't already know, match the forage available, look for structure, go deeper in clear water and of course put time in on the water. Of course he went into a lot more detail Andrew told Scott and I that he would be amenable to speaking at a member meeting in the future and I will follow up on that. RICH will run a fly and jig tying session using eyelash yarn and and satin material, this will be Saturday, March 9th from 12 - 3 ? at Run a ways restaurant rt 56 just East of rt 25 in N. Aurora. They have a back room that could hold about 20. Anglers can tie along or watch.